Therefore, our welcoming staff is always ready to serve you in both the indoor and outdoor section of the restaurant! First of all, our well-chosen menu is sure to please every good food lover. However, those are just a small part of the healthy/vegan dips which deliciously add to our menu! Hommos: A dip made from well-cooked chickpeas blended with tahini, lemon juice, garlic and a touch of olive oil. Baba Ghanouj: A dish of barbecued eggplant, mashed and mixed with pomegranate and olive oil. A pinch of traditional seasoning is added too! Mhammara: A dip for the spicy-taste lovers. What’s in it? Dip Sampler, with Mhammara, Baba Ghanouj, and Hommos! Delicious Lebanese dips. 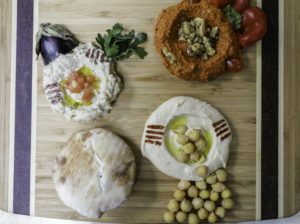 Arlington’s Most Delicious Lebanese food! Our chefs take pride in giving customers a flavor to remember, so, let us tell you how. The refined recipes became unique due to many trials. Therefore, reaching the ideal taste in Lebanese cuisine. Furthermore, we offer traditional and local wines and a well-known Lebanese spirit “Arak”, which, also, accompanies any mezza. Mezza: A selection of Lebanese meals that can be considered as appetizers. Arak, best Lebanese spirit in Arlington Va! Above all, our main courses are sure to satisfy all the choices. by, certainly, using our well-organized full catering services. As a result, customers are served the best Lebanese food in Arlington!